I saved this photo for the last of the No Thoroughfare Trail because it was a stopping point and I liked it even better than the First Waterfall. 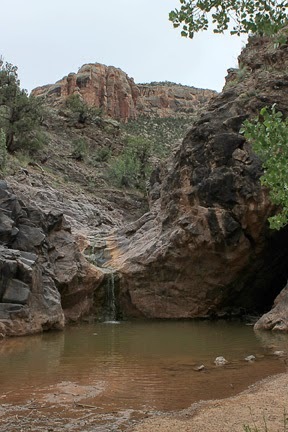 The water flows out of the rocky valley and drops into the quiet pool. It is surrounded by trees that are obviously thankful for the moisture. And it makes a nice resting spot about halfway on the trail. But for us here, it's the end of the trail and we'll move on to a new topic tomorrow.